On Second Scoop: Ice Cream Reviews: Sunday: Tasty Sundae! Sunday really is a great day for ice cream. We were expecting company, so we had to be a little quick today, but I couldn't let fresh, hot brownies go cool without making a couple of brownie sundaes for our afternoon snack. I will admit there was a small brownie mishap (ummm, like ingredients getting "mostly" in the bowl). Sure it's a little flat, but hey, they still taste like brownies and that's all that matters. 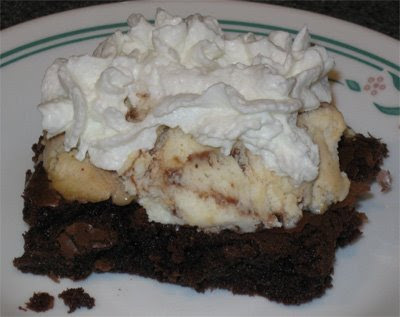 My daughter requested Breyers Chocolate on her brownie and then the whole thing quickly disappeared. I decided to try and be a bit more creative by giving myself a layer of Breyers Peanut Butter Fudge. Overall, I'd say my daughter made the better choice. Mine wasn't bad, but I guess I wound up longing for the simplicity of vanilla on chocolate. Actually, some chocolate sauce may have worked as well. The number one flavor in a brownie sundae needs to be chocolate, plain and simple.